As the 365-day symphony of 2014 reaches its final bars, I find that a great way to evaluate the music of the year - in both personal and universal contexts - is through books. 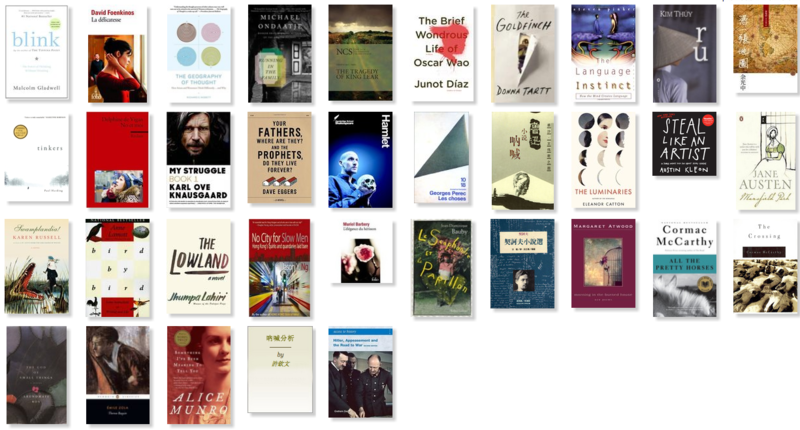 Above are the 35 books I read this year (thank you, Goodreads, for helpfully generating the image), listed in chronological order starting from the bottom right. Well, 2014 was the year of academic reading. 10/35 books this year were read for academic purposes or in an academic context. I have a Goodreads policy of only listing the books I've perused totally as "read," so the number is actually higher. Out of these books, 2 were re-reads (Cormac McCarthy!) in preparation for my extended essay, 2 were Chinese and 1 was French. Despite having read these books "for school," however, I enjoyed them, fell in love with several and was certainly inspired to read further because of what I'd read on their pages. In 2014, the reading world went crazy for Karl Ove Knausgaard's The Struggle, Donna Tartt won the Putlizer for The Goldfinch and Dave Eggers published Your Fathers, Where Are They? And the Prophets, Do They Live Forever? I also spent the year catching up on the books that had captured the attention of the literary world last year: Alice Munro's Something I've Been Meaning to Tell You and Eleanor Catton's The Luminaries. This year, I was further convinced that I love reading about the tropical: Jhumpa Lahiri's The Lowland and Michael Ondaatje's Running in the Family filled my year with lyrical prose and enrapturing stories. Speaking of Running in the Family, I also ventured into the realm of memoir/personal narrative this year, not only with My Struggle, but also with Jason Ng's No City for Slow Men, Kim Thuy's Ru, Jean-Dominique Bauby's Le Scaphandre et Le Papillon and Annie Lamott's Bird by Bird. I was also able to complete some to-reads this year: the aforementioned Bird by Bird, Swamplandia, The Brief Wondrous Life of Oscar Wao and Blink, for instance. Meeting Junot Diaz was just the cherry on top of the literary ice cream. These books have bookmarked my year like rehearsal letters on sheet music. Remembering them is to recall how I spent my days in 2014. Once the SATs were over, I sequestered myself in the HK Library and at home to devour Bird by Bird and Swamplandia; I remember reading The Luminaries in the car on my way to my violin teacher's home; I read 9 books over the summer (from Les Choses to The Language Instinct); I read Your Fathers while waiting for my flight to Pennsylvania; I bought My Struggle and Tinkers in Boston; I remember reading the latter in the lobby of the hotel I was staying at in New York; I read The Language Instinct in the final week of summer while my brother was at his internship; I devoured The Goldfinch over the second extended essay week period and loved that bildungsroman with all my heart. Looking at these books, I'm also able to set myself some New Years' Resolutions. This year, the ratio of French books to Chinese books I read was 2:1; next year, I hope to close that ratio un peu. I will continue to immerse myself in more non-fiction books and memoirs. I'll try to read the Pulitzer/Orange Prize/Nobel/etc. winners of 2015 in 2015. Of course, I'll also keep reading nonfiction (I have a bunch of books about intuition on my desk right now). 2014 has been a year well-spent reading and writing; I hope the new year will bring its wealth of words and wisdom into my life.